Heading to the Hamptons or the East End with your family in tow? Besides visiting the beautiful beaches, there are plenty of things to do with your kids from museums and water parks to animal farms, berry picking and more. Here's a list of family-friendly places to check out on Long Island's East End. Often busy with a combination of year-round residents and summer visitors, adults and children alike are welcome to play at Puff & Putt Family Fun Center (659 Montauk Hwy., Montauk), a nautically themed mini-golf course. 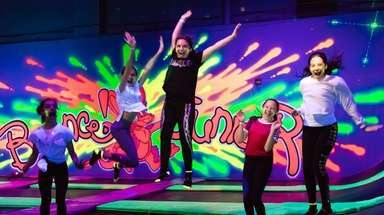 There are also a number of boats for rent (paddle, kayak, paddle boards) and an arcade stocked with a selection of stand-up, old-fashioned video games. Call 631-668-4473 or visit puffnputt.com for more information. 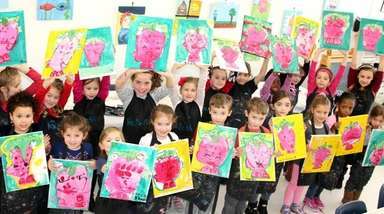 Providing a modern learning environment for visiting children, the Children's Museum of the East End (376 Bridgehampton-Sag Harbor Tpke., Bridgehampton) is a family-friendly museum with activities, exhibits and classes for kids 12 and younger. The museum is also available for birthday parties. Snacks and beverages are available from vending machines (food is not permitted in the museum). Call 631-537-8250 or visit cmee.org for more information. At the Animal Farm Petting Zoo and Family Park (296 Wading River Rd., Manorville) you'll find parrots, monkeys, camels, llamas, reptiles, an ostrich, kangaroos and other exotic animals. You can bottle-feed baby pigs, get in the pen with baby goats, cuddle with chicks and guinea pigs; admission includes free pony rides. Visit afpz.org or call 631-878-1785 for more information. Fairview Farm (19 Horsemill Lane, Bridgehampton) features a U-pick area with fresh produce, pies, eggs and flowers during the warmer months of the year. The farm is well-known for its tremendous seasonal corn maze (Sept.-Nov) that grows every year, a puzzler that can take an hour or more to maneuver as you answer questions that direct you which way to go next. For more information, call 631-537-6154 or visit fairviewfarmatmecox.com. 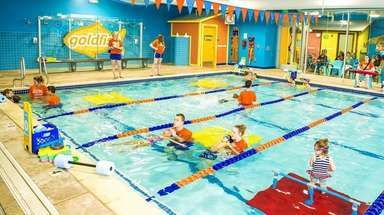 Splish Splash features (2549 Splish Splash Dr., Calverton) more than a dozen water slides, a kiddie area, wave pool, lazy river and interactive play area. The concessions on the "boardwalk" offer chicken, French fries, grill food, pizza, snacks and ice cream. Call 631-727-3600 or visit splishsplash.com for more information. Take a ride on one of the Long Island Live Steamers at Southaven County Park (off of Gerald Road, Brookhaven). Passengers can ride around the eight acres of track on an electric-powered train (public run days are held twice monthly from May through October). Visit longislandlivesteamers.org or call 631-537-6154 for more information. You'll find several live animals on hand, a marine life touch-tank, butterfly garden and other interactive exhibits at the South Fork Natural History Museum and Nature Center (377 Bridgehampton-Sag Harbor Tpke., Bridgehampton). There are also interactive hands-on exhibits and a panoramic deck with a view of preserved acres of fields and woodlands. The Vineyard Nature Tail is also there, which meets up with the Long Pond Greenbelt. For more information, call 631-537-9735 or visit sofo.org. East Hampton Town Marine Museum (301 Bluff Rd., Amagansett), which is operated by the East Hampton Historical Society, tells the story of Long Island's East End community and its relationship with the sea through artifacts, photographs, models, displays and three floors of exhibits. Call 631-324-6850 or visit easthamptonhistory.org for more information. Southampton Golf Range (668 County Rd. 39, Southampton) features a driving range (more than 40 tees), miniature golf, snack bar and batting cages. Golf instruction is available by appointment. Visit Visit southamptongolfrange.com or call 631-283-2158 for more information. The Hampton Arts Cinema (2 Brook Rd., Westhampton Beach) has two screens and features a selection of popular films. Snacks and food concessions are available, and movies run year-round. Visit hamptonartscinema.com or call 631-288-2600 for more information. 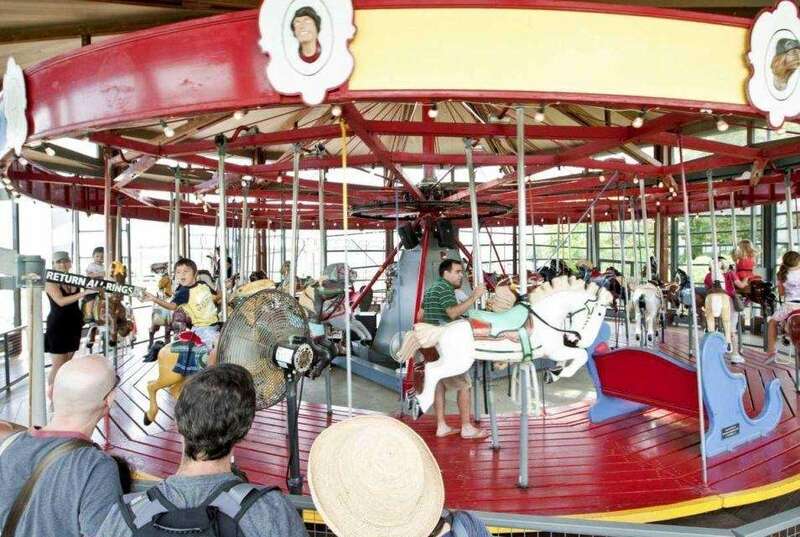 Take a spin on the Greenport Carousel (115 Front St., Greenport). The restored vintage 1920s carousel is located in the Glass Carousel Pavilion at Mitchell Park. If you grab the brass ring, you win a free ride. For more information, call 631-477-2200 or visit villageofgreenport.org. Spend the day at the end of the Island at the Montauk Lighthouse, the oldest lighthouse in New York (2000 Montauk Hwy., Montauk). You can climb to the top and there's a museum and gift shop at the base. Be sure to take in the spectacular views of the ocean. Call 631-668-2544 or visit montauklighthouse.com for more information. Main Beach Surf and Sport (352 Montauk Hwy., Wainscott) is a two-story shop stuffed with kayaks, canoes, surfboards, skateboards, paddle boards, bicycles, waterproof cameras, sunscreen, swimsuits and anything else beach-bound families may need. They offer lessons and rentals (boards, bikes and boats) as well as adventure excursions. Visit mainbeach.com or call 631-537-2716 for more information. At the Parrish Art Museum (279 Montauk Hwy., Water Mill) is a re-installation of its permanent collection with special exhibitions and an array of family and adult activities and events, including workshops, performances and children's art classes. For more information, call 631-283-2118 or visit parrishart.org. This Big Duck (1012 Flanders Rd., Flanders), built in the 1930s, has become one of Long Island's most famous roadside landmarks. Visitors can roam inside the duck for tourist pamphlets and to purchase duck memorabilia. The Big Duck also hosts holiday-themed events, including the annual Holiday Lighting, held on the first Wednesday after Thanksgiving. It's also listed on the National Register of Historic Places. Call 631-852-3377 or visit bigduck.org for more information. The Milk Pail (1346 Montauk Hwy., Water Mill) is a U-pick farm that grows 26 varieties of apples, including McIntosh, Jonamac, Gala, Cortland, Honeycrisp, Empire, Red Delicious, Golden Delicious, Fuji, Braeburn and Granny Smith. It also has peaches, pumpkins, berries, baked goods, flowers and cider. Visit milk-pail.com or call 631-537-2565 for more information. Visit an all-living coral reef, a 120,000-gallon shark tank, sea lions, touch tanks, "ray bay" where you can feed the stingrays, fish, penguins and more at the Long Island Aquarium and Exhibition Center (431 E. Main St., Riverhead). Plus, you don't want to miss the Butterflies & Birds exhibit. For more information, call 631-208-9200 or visit longislandaquarium.com. Red Creek Park (102 Old Riverhead Rd., Hampton Bays) features a skate park, rink, athletic fields, hiking trails, activity center, picnic grounds and playgrounds. The grounds also feature volleyball, basketball and tennis courts, as well as baseball fields. Call 631-728-8585 or visit southamptontownny.gov for more information. You enter through the jawbones of a whale at the Sag Harbor Whaling Museum (200 Main St., Sag Harbor). Families can check out paintings, log entries, scrimshaw, harpoons and other items associated with the industry. Additional displays include antique toys, china and Victorian era crafts from the Sag Harbor area. Visit sagharborwhalingmuseum.org or call 631-725-0770 for more information. Consisting of five theaters, the UA Hampton Bays Theatre 5 movie house (119 W. Montauk Hwy., Hampton Bays) shows major motion pictures throughout the week. Concessions include popcorn and soda, as well as various candies and snacks. For more information, call 631-728-8251 or visit regmovies.com. A 17th century grist mill still spins at the Water Mill Museum (41 Old Mill Rd., Water Mill). The mill features exhibitions of local history, milling of grain, corn grinding demonstrations and children's activities. Call 631-726-4625 or visit watermillmuseum.org for more information. The Shinnecock Nation Cultural Center and Museum (100 Montauk Hwy., Southampton) houses 10,000 years of Shinnecock history. Visit shinnecockmuseum.com or call 631-287-4923 for more information. 24 ways to enjoy summer on LI before school startsNo matter where you live on Long Island, there are vast resources for you to tap into for some fun. 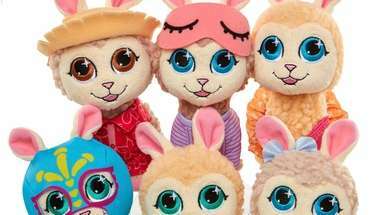 50 must-have summer and pool toys to buy nowThe weather is warmer, flip-flops are on and beach days are ahead. That can only mean one thing: It's time to stock up on new summer toys. 15 family day trips on Long IslandHere's a rundown of family-oriented eat-and-play experiences available in Nassau and Suffolk, perfect when planning a fun family day trip.